Learning is a lifelong occupation. This proposition is itself a truth that we learn as we journey through the many stages of life. I like to repeat the comment of Mark Twain when discussing lifelong learning. He said that, as an 18-year-old, he was amazed at how very little his father knew, but by the time he was 23 he was amazed to discover how much his father had learned! Twain came to appreciate the lifetime of learning and wisdom his father attained, even though Twain had failed to recognise it as an 18 year old. We begin to learn from birth and never stop. It is wonderful to observe the way a newborn baby is learning virtually from their first moments. The baby already knows the mother’s voice and many other sounds that could be heard from within the womb. In the first weeks and months following the birth, the baby learns how to recognise and read facial expressions, along with learning from experiences of warmth and security, nourishment and loving care. We never stop learning. We learn firstly from our families, later at our schools and within our communities. As adults, our learning continues through the interactions we have with others and the broad range of experiences that life throws up for us. Parents are our first teachers. They are assisted by the professional educators in our schools, along with the many people we encounter as we grow to adulthood. The teachers in our schools occupy a special place in our lives and have a profound impact on us. As I was thinking about the theme of Teaching and Learning, I naturally thought of the teachers that I had at school. Each one has left me with something that has carried me through my life so far. One in particular is Peter Mitchell. Peter began teaching at the Christian Brothers’ primary school at Bedford. It is now Chisholm College, which is a very large secondary school. But back then, when I started at the school in Grade Five, there were four classrooms on a small parcel of land, next to a dairy farm. Peter was sent to Bedford and assigned to teach grade six. I met him about 40 years later, and he rather deprecatingly remarked that he really had no idea what he was doing, he was learning on the job, for it was his first year of teaching in a classroom. I reassured him, I hope, by saying that he was one of the outstanding teachers that had taught me. It is true. What impressed me about his teaching was his respect for us. Later, I came to understand that he believed in the innate dignity of each person, and still later, I learnt that this fundamental plank of his teaching charter had come from his experience of the love and respect that Jesus has for each one of us, as testified in the gospels. Education is said to be the process by which the human person can become more human. Peter, then and now, proposes that through acting with the attitude and values of Jesus, teachers and students can find a better and more positive way in responding to situations in life. Above all, we can learn ‘to step into the shoes’ of the other person and be more understanding and less judgemental. He proposes a way from negative criticism to finding a bridge to cross over to rebuild relationships. Peter went on to develop a wonderful resource for schools entitled, Making Jesus Real (MJR). When I read it, I could recognise words and phrases that he was using 40 years ago and which had an enormous impact on me and my classmates. He made being a Christian real. MJR is perfectly aligned with the religious education program in our Catholic schools. It provides a way for children to learn how to take on the attitudes and values of Jesus, and so to learn how to live in a positive way with others, themselves and God. I was struck recently by a couple of sentences I read about the calling of the teacher in our Catholic Schools. It says, “The Catholic teacher, therefore, cannot be content simply to present Christian values as a set of abstract objectives to be admired, even if this is done positively and with imagination; they must be presented as values which generate human attitudes, and must be encouraged in the students. Examples would be these: a freedom which includes respect for others; conscientious responsibility; a sincere and constant search for truth; a calm and peaceful critical spirit; a spirit of solidarity with and service toward all other persons; a sensitivity for justice; a special awareness of being called to be positive agents of change in a society that is undergoing continuous transformation”. 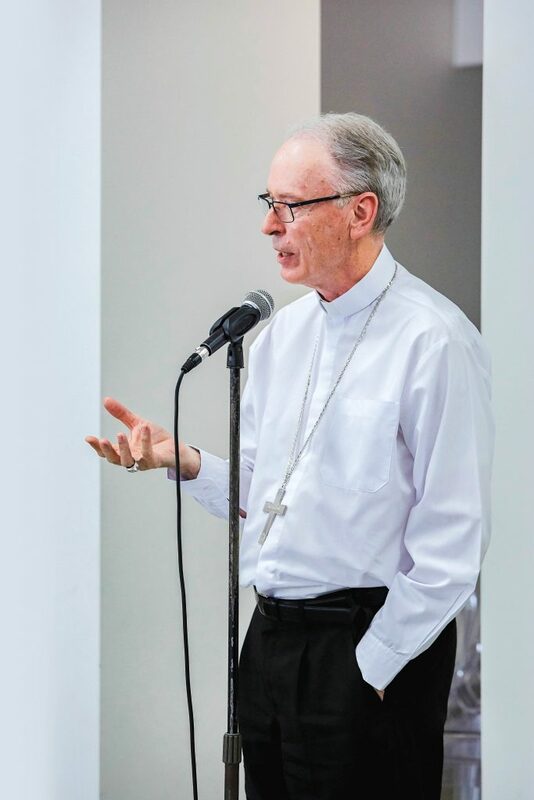 Peter has been a successful Catholic teacher and he has had the good fortune to be able to inspire so many others through the support of the Tasmanian Catholic Education Office. MJR has the power to enhance teaching in our schools in very simple and practical ways. Teachers who participate in MJR gain new confidence when providing clear witness of their faith through the ways they interact with the children. In order to teach, they themselves have to become apprentices to Jesus, the Teacher, so that they can put on the mind of Christ. As St Paul once wrote. It is by learning who Jesus is, and what and how he did things that we can take on his attitudes and values in all of our relationships.